Being affected by the UK referendum, USDCAD is also under the influence of other economic data such as Building Permits (M/M) and Ivey PMI in Canada and DOE Crude Oil Inventories, DOE Distillate Inventories, DOE Gasoline Inventories and DOE Refinery Utilization in the US. Today USDCAD created a bearish candle and it is still falling within the descendant channel. 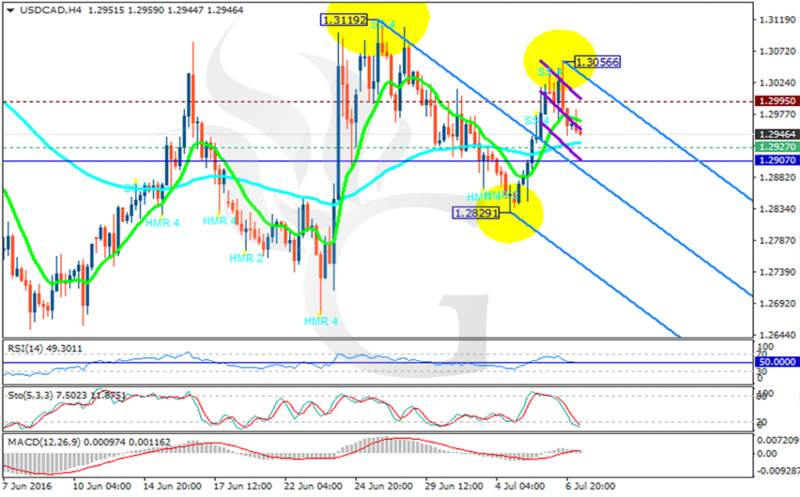 The support rests at 1.29270 with resistance at 1.29950 which both lines are above the monthly 1.2907 pivot point at 1.29630. The EMA of 10 is moving above the EMA of 75. The RSI is going above the 50 level, the MACD indicator is in neutral territory and the Stochastic is showing downward momentum. The support level breakthrough will pull the price lower to 1.29.